Japanese tea is this fine, greeny-gold drink which adds as much fragrance as meaning to life. The traditional slow way of drinking it teaches patience, gratitude, and modesty. I was told by a Japanese friend, Ayaka, originally from Kyoto who was involved with her dad in the green tea trade, that May-June season was known for the grassy-tasting early teas, the best throughout the year. She also added that, during this season, the early tea is commonly given as a present to consolidate relationships within society. Moroccan tea, on the other hand, is this hot, sweet drink that symbolizes hospitality, generosity, and the perpetuation of customs. 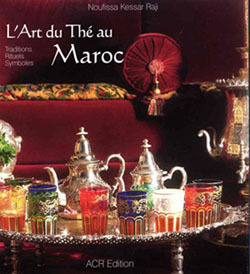 Contrary to Japanese tea, Moroccan tea is seldom found in shops, and must be drunk right after its preparation. 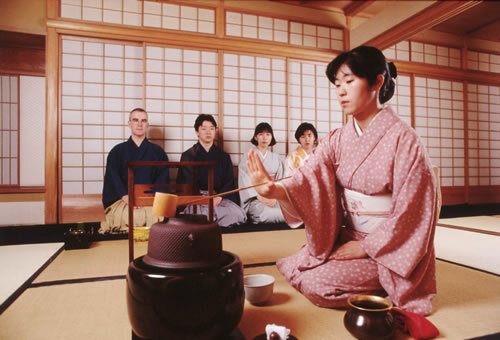 The Moroccan tea ceremony differs from the Japanese tea ceremony in terms of the atmosphere. In fact, the ambience in a typical Japanese tea ceremony is very serene and the tea is served in a humble manner and mutual respect. While in a moroccan tea ceremony, people would be telling jokes and laughing outloud while drinking tea. Notwithstanding, o ne similar aspect rests in the fact that the tea time is the time when people congregate. 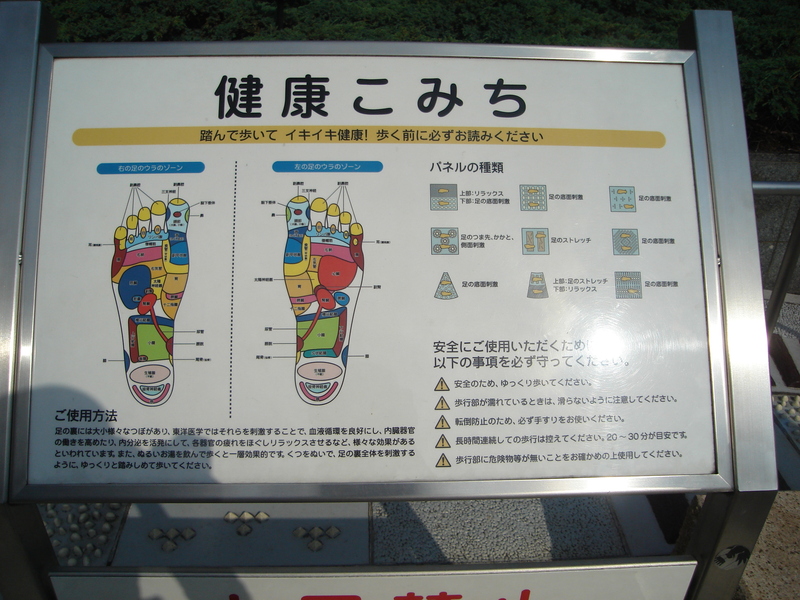 For those of you who have had the chance to try this asian practice, you probably know that it enhances the functionning of the body organs, by applying pressure on certains areas in the feet connected to the respective organs.In fact, reflexology is so ingrained within the Japanese culture that they offer free reflexology for those incapable of affording it. For anyone is eager to know why the Japanese are so serene despite all the stress encompassing their lives, the reason is very obvious! Relaxation is primordial and Japanese people from different social classes allocate time to take care of their bodies. On my visit to Ginza, I was stunned to find a free place in which stones, in different sizes, are scattered in precise places and stuck to the ground. I was lucky enough to witness an old couple (see opposite picture) using it. I imitated every single movement they did, amd I have to say that I have never felt more relaxed in my life, all the feet pain caused by the heels vanished. Looking at the stressful and hectic lives Japanese lead, one cannot help but wonder: how and where do they unwind? In case they do relax, when does it occur? Well, some may suggest clubs and Kareoke places! That may be true for single people or youngsters, but what about married or old people? Actually, what I am about to disclose to you is an aspect of the daily life of the rich Japanese. In fact, it is a place I found by chance while searching for a nail shop to get a Japanese pedicure and a foot massage after a long gruelling day. It is a paradise of relaxation. 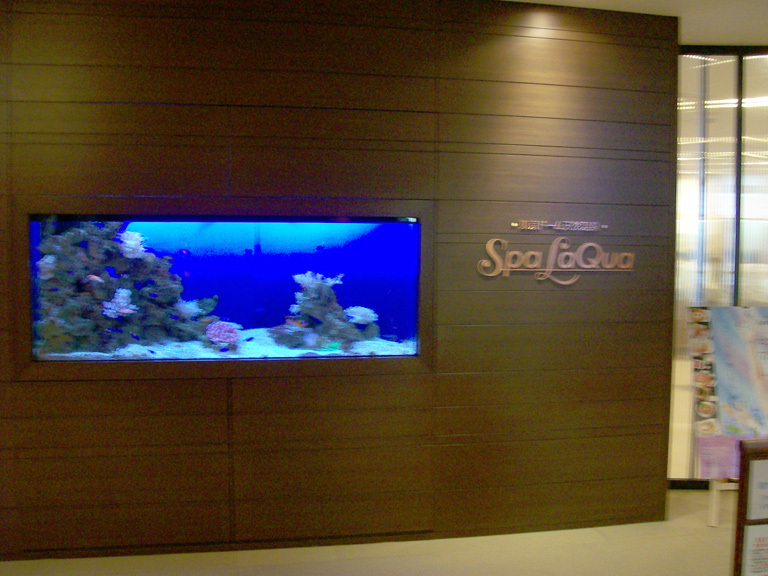 This place was called Spa Laqua. It extended over three floors on top of the Korakuen mall, in front of the Baseball Stadium. Driven by curiosity and a sense of adventure I decided to try the facilities provided. I could see couples and people from different ages come in one after another while asking the English speaking staff about the prices. 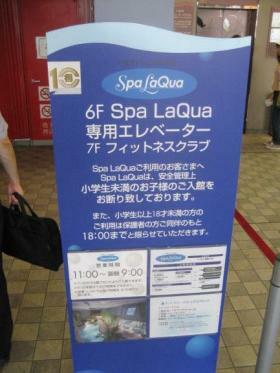 They had segregated showers and Jacuzzis; however, the massages were offered for both men and women. As I ventured in the building, I noticed a remarkably relaxing atmosphere. Being a Muslim woman, I could not show skin; so I settled for Reflexology, a very precise foot massage that enhances the blood circulation and boosts up the metabolism of the body. The Spa was open all night long til seven in the morning and they had relaxing beds with relaxing music upon which many Japanese fell asleep. 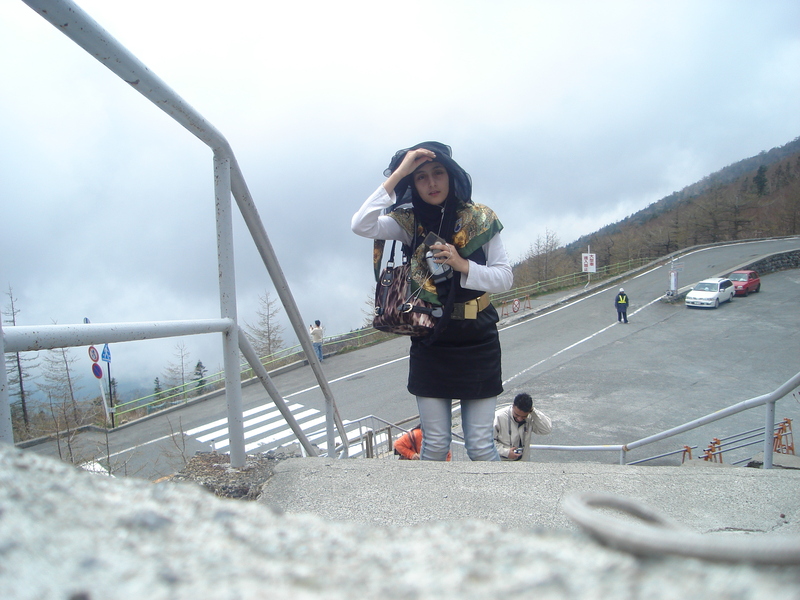 All the people around me were Japanese, I did not come across any foreigner. 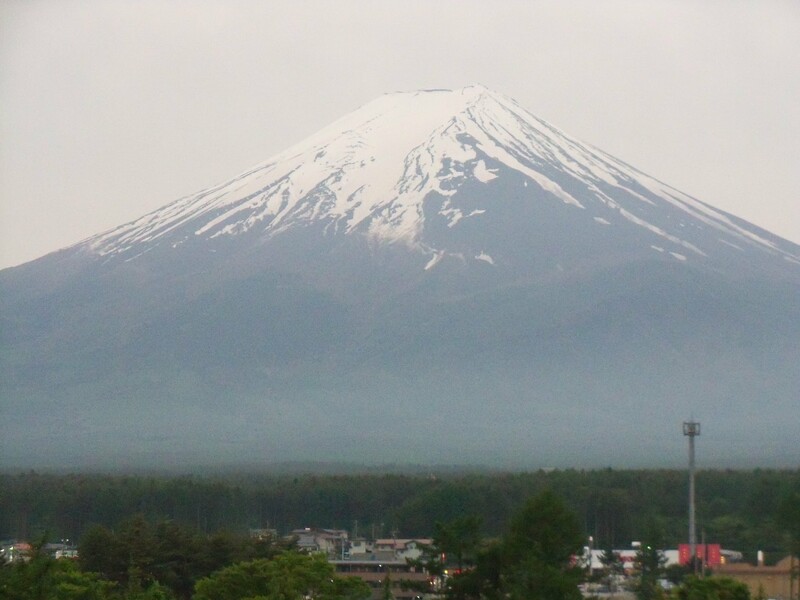 Silence, relaxation, and meditation are highly appreciated features that highlight the Japanese culture. In addition, it seems that Japanese people are fond of massages;perhaps, because it keep them going through their challenging lives. Throughout our trip, there is one thing that seemed to be found everywhere we went, a yellow stripe running down the middle of all sidewalks in Japan. At the inception, nobody was able to decipher the function of these lines. I tried to conjecture its utility but in vain. 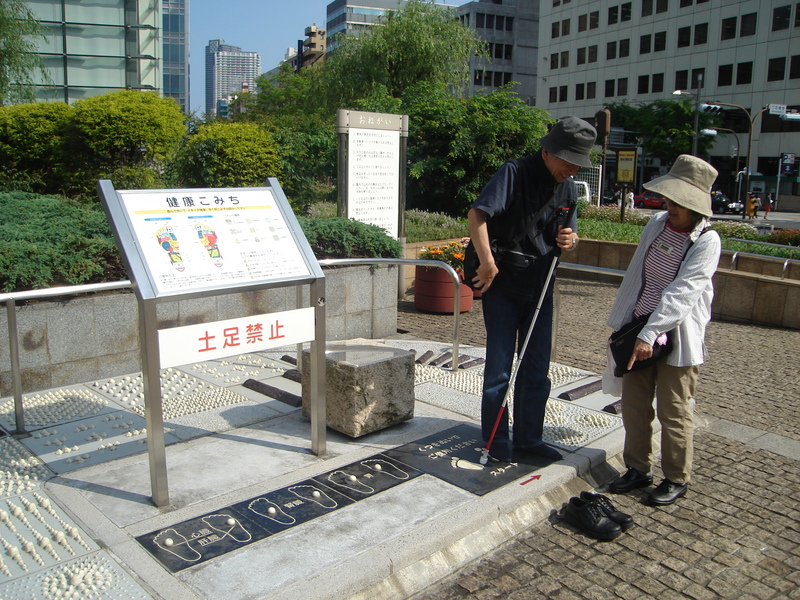 Perplexed, I asked Dr. C and he replied saying that the line of tactile tiles marked a safe path for the visually impaired pedestrians. So I decided to do some research to understand further how this walking system works. Basically, the straight bars in the tiles denote that the area is clear without obstructions, thus it is safe to walk forward. 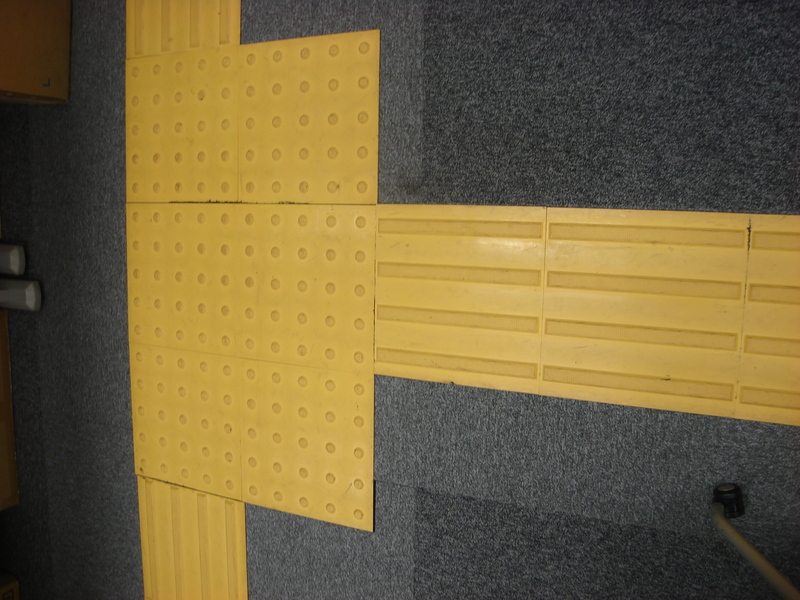 Beaded surfaces warn the blind pedesterian of an intersection or an obstacle ahead such as an obstruction,a door, steps or the train platform edge. 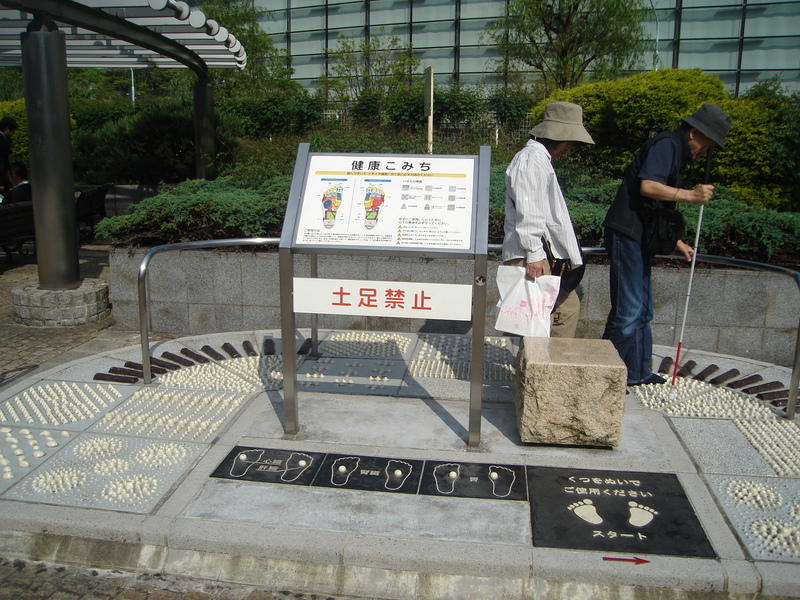 Contrary to Dubai, where one rarely encounters handicapped or visually impaired people due to the culture that tries hard to hide them from the public eye, Japan provides training for the blind people in order to enable them to lead an independent life as they wish.Moreover, music can be found at intersections to help the blind and partially-blind pedestrians travel safely without depending on other people. Stunning! According to wikipedia, “Law for the Promotion of Sorted Collection and Recycling of Containers and Packaging, has been enforced in April 1997 by the Ministry of the Environment to reduce the waste of glass containers, PET bottles and paper cartons”. 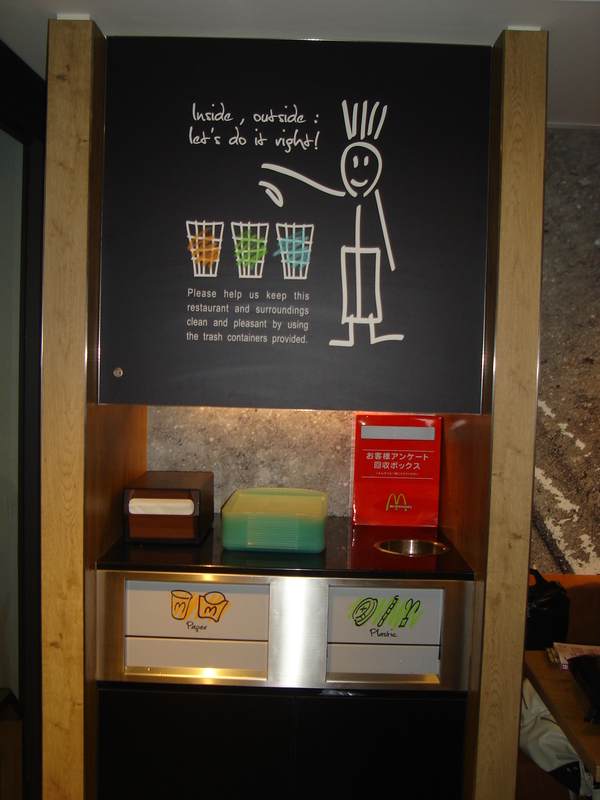 It is stunning that such an eco-friendly law was established for so long in Japan whereas the rest of the civilized world still hesitates adopting recycling . It is evident that The resources are no longer going to suffice in a world of scarcity. Therefore, I believe that there must be a universal law that oblige developed countries to embrace recycling and to follow the pathway of Japan. I was astonished not only by the recycling bins found everywhere, but also by the awareness created within the public and how people abide by this law. In Dubai, even if some people endeavor to reinforce such a practice. Most citizens are apathetic. For instance, in our modest campus, in academic city, recycling is adopted; nevertheless, many folks do not bother to use them. 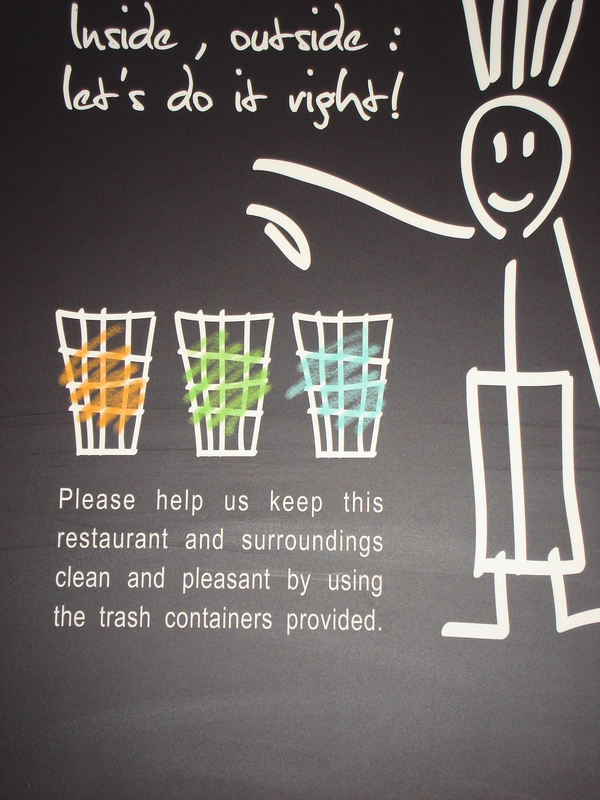 Instead they use the regular trash. 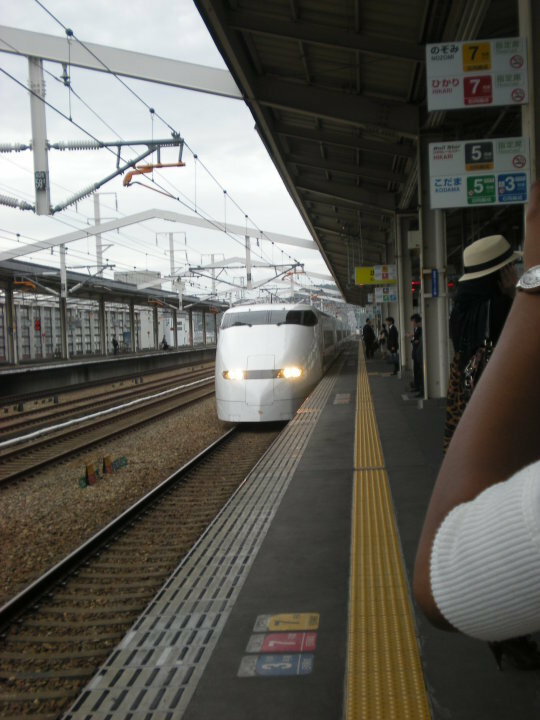 I personally was one of those who did not care much, but my visit to Japan awakened in me a sense of responsibility towards my environment. 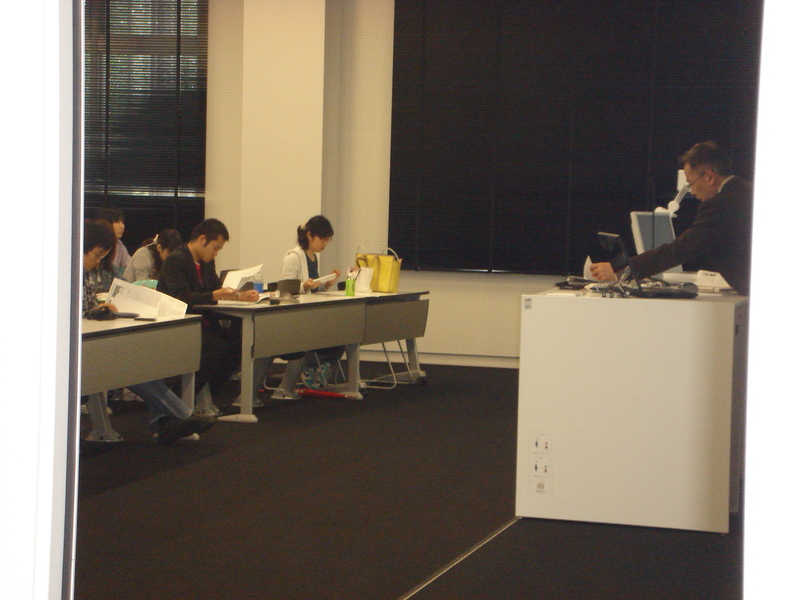 Japanese College Students: Assiduous or not? Upon our visit to Waseda University, my entire schema of a typical Japanese student altered. I have for so long admired the Japanese for their astuteness and intelligence. My appreciation was built up from a very a young age, as I grow accustomed to watching Conan, a cartoon in which the main character is a shrewd detective who always finds clues in an almost perfect crime scene and eventually ascertains the identity of the murderer. The crime scene is so meticulously done that the spectator can’t help but admire the talent of the story maker rather than the main character “conan”. In addition, the technology we have seen recently made me appreciate them further. In my mind, I thought that intelligence and diligence were inherent features that run in the Japanese Gene pool. To my detriment, I came across a harsh reality. College-level students are not all studious. In fact, most of them rarely attend classes. Even more unusual, the students admitted into the well renowned Waseda university, spent their highschool years studying without respite and trying to achieve a good score in their admission tests only to become indifferent and lazy in college. I found it extremely awkward that students who have been through an enormous struggle throughout five consecutive years are incapable of mastering English, a fairly easy language.